The lesson plans below were designed by Ellen Quish. Exploring New York City's ethnic neighborhoods can encourage language development and help familiarize English language learners with the many cultures that make up their new city. This lesson moves students out of the classroom and asks them to document their observations, interview locals, and present their findings about the neighborhoods of Harlem, Jackson Heights, and Williamsburg. Talking about art can encourage language development as well as be a stimulus for creative writing. This lesson combines art and literature by engaging students in discussion and writing about masterpieces found at the Metropolitan Museum of Art. New York City is rarely thought of as a place where one comes in contact with nature. In celebration of the arrival of spring, this inquiry-based lesson invites students and teachers to seize the plethora of language-building opportunities that exist outside of the ESL classroom and learn about the natural wonders and wildlife of New York City. History textbooks often fail to reflect the lives of women and their many achievements. In preparation for Women's History Month, this inquiry-based lesson presents students with opportunities to learn about and honor the accomplishments and influence of history's most notable women. The lesson plan below was designed by Greg Timmons. Article III of the U.S. Constitution provides for a Supreme Court and various other courts that Congress might deem appropriate. Though the past two centuries, the Court has helped to keep the balance of power between the other two branches of the federal government and helped to define the rights of citizens. The lesson plans below were designed by Joy M. Barnes-Johnson. In this self-guided lesson, learners will review a variety of geometric shapes and ways of calculating area, and begin to understand how patterns can give us insight into art and culture. Many people take the basic principles of geometry for granted, yet the rules for solving problems in geometry can often help us solve real-world challenges. In fact, contractors, architects and artists often use these rules to create their work. As part of the PBS mission to "inform, inspire and educate," this lesson seeks to promote cultural awareness and competence, examining specific patterns in Islamic art, promoting cultural literacy and making connections to math content. Basura means trash in Spanish. In this lesson, students will learn about the materials used to manufacture products and the importance of the "three Rs" (Reduce, Reuse, Recycle) for improving our environment. Waste reduction and recycling are civic responsibilities that are relatively easy to do. Recycling also gives whole communities an opportunity to improve the environment. From Central America to Central Park, we can all do our part! This lesson will help students make connections between two math disciplines for problem solving: algebra and geometry. The Pythagorean theorem is probably one of the most widely recognized and often recalled formulas from high school math class. Building on the momentum of memory, students will derive the less-familiar distance formula from the very familiar a² + b² = c² expression. According to the New York State Cancer Registry, approximately 100,000 New Yorkers will be diagnosed with new cases of cancer every year, the effects of which extend far beyond diagnosis. Friends and family often seek answers to difficult questions about how cancer happens. In this multimedia, self-directed lesson, adult learners will gain insight into this enigmatic disease. The lesson is also intended to help learners develop skills of reflection as they conduct Web research and journal writing. This self-directed lesson will review the check writing process while building mental-math skills and providing insight into careers and real-life contexts. Various Web sites will be used to create a realistic view of independent adult living�it really is an eye opener. Have you ever thought, "How can I demonstrate the importance of punctuation to my students?" Punctuation is one of a writer�s most basic tools-when used well it helps readers see ideas more clearly. Unfortunately, the rules of punctuation are sometimes difficult for students to remember, especially English language learners�but fortunately, each punctuation mark has its place. This lesson will build skills in effective use of punctuation marks like commas, semi-colons, colons, dashes, and exclamation points. Awesome! Using video accessed through Unitedstreaming and various Web-based activities, students will build skills necessary to write using American English conventions of punctuation. A person's legacy is a reminder of his or her life, work, goals and achievements. History is often the legacy of ordinary people who dared to dream. This lesson can be either self-directed or classroom-based in Language Arts or Social Studies, for individual adults, ESOL learners or GED students: the choice is yours. As an extension and in honor of Black History and Women's History months, examine the life of Ms. Rosa Parks to learn how everyday people shape extraordinary events. Biology is the study of what is going on inside living things. Approximately forty-five percent (45%) of the GED Science test will contain questions related to the various characteristics, structure and functions of living systems. This lesson will help learners become more familiar with life science in the context of the scientific method and will help them to become familiar with the various kinds of life science diagrams they may see on a GED science test. Az�car means sugar in Spanish. Latino culture is a "sweet" part of the American experience. The notion that life lived to its fullest is filled with sabor (Spanish for flavor) is the basis of this lesson. This lesson extends Thirteen/WNET�s annual celebration of Hispanic Heritage Month in September by asking students to celebrate heritage through holidays all year round. Use this lesson to tour Hispanic culture, online! And in case the rhythm moves you, go out and enjoy all that your community has to offer during this wonderful celebration of rich culture, rich traditions and rich life. It is easy to underestimate the importance of fractions, decimals, percentages (and their intersections) in our everyday life. Sure, most people can handle simple computations that require use of fractions like 1/2, 1/4 or percentages like 100% or 50%, but what happens when you are asked to use a series of these values or more complicated numbers instead? Use this lesson to help your students become mathematical wizards at performing unit conversion calculations. All over the globe, people�young and old�grapple with the concept of "a personal identity." It's a challenge that many will face time and time again. For immigrant populations in the United States, this challenge can be particularly daunting because of the overwhelming influence of American culture over much of the world. By looking at the experience of Chinese American immigrants in the PBS series BECOMING AMERICAN this lesson will ask ESL learners to investigate and explore their own identities within a multicultural context. Summer kitchens are perfect laboratories for inquisitive minds. Food science is an exciting field that uses skills and concepts from just about every science discipline imaginable: biology, chemistry, engineering, and math are just the beginning! Whether you choose to simply observe what happens in and around the kitchen or you try to stir a few things up on your own, you�ll have plenty of fun and learn science principles. This self-directed lesson can be used to help generate ideas about the most scientifically sound ways to prepare foods safely and efficiently during the summer season. It also uses the GED Connection Science Workbook, so you can build and practice the skills necessary to prepare for the GED Science test. Do you ever get concerned about credit-card debt? The next time you use your credit card at a department store, restaurant, or ATM, take a step back and think about how credit works. When used carelessly, credit cards can be at the center of a personal financial crisis for consumers. High interest rates, variable Annual Percentage Rates (APRs) and extra fees compound quickly, which can lead to out-of-control debt. In honor of financial education month, this self-directed lesson will give learners the tools they need to become knowledgeable credit consumers. The companion website for the ITV program TV-411 will be used to provide learners with an interactive experience of all that credit has to offer. Cross-reference the lesson, DEBT-rimental to review principles of graph analysis before completing this lesson. One of the most important critical thinking skills people have is the ability to analyze a variety of images and symbols that appear alongside everyday words and text. By everyday words and text, we mean text found in newspaper columns, business reports, bank statements, and utility bills. These examples often use graphic images like charts, graphs, tables, and pictures to supplement the text to help the reader's understanding of it. This lesson engages learners in the analysis of various types of graphs common in daily life. It can be used as a stand-alone lesson, substitute lesson plan or self-directed study in preparation for the GED. Have you ever stopped to think about the change in your pocket? How many dimes do you have? How many quarters? In this self-directed lesson learners will begin to understand algebraic relationships using the coins in their "pocket." Interactive games that demonstrate how to estimate during algebraic problem solving processes will help the learner build a framework for understanding how to complete math word problems in a way that makes complete "cents!" One of the ways that oral traditions are preserved is by telling stories. Somehow, stories seem to grow every time that they are told. Stories become information that may eventually become history. This lesson will engage students in the process of building stories from a variety of objects stored in a box. It will incorporate listening skills and creativity as a basis for developing writing skills. The U.S. Constitution begins with the statement �we the people�. It is an affirmation that the purpose of government is to establish and maintain the rights of humanity. This historical document is a 230-year old guide that details the vision of its creators �to form a more perfect union� in a brand new nation of many different parts. One of the important institutions established in the Constitution is the Electoral College. This lesson will help learners better understand the quadrennial ritual surrounding the election of a president in the United States of America. The task of finding a job in a competitive market is a daunting one that often finds job seekers discouraged and disconnected from their dreams of gainful employment. A common mistake among qualified candidates is a weak resume that is blas�, too long or too general for any human resources executive or business owner to quickly determine how a job seeker's skills and profile match the requirements of a vacancy. This lesson will help learners build a practical resume using Microsoft Word R�sum� Wizard. Hints useful for avoiding "r�sum� wrongs" will help learners develop the right r�sum� for their job hunting needs. A, B, C and D are the first four letters of the American English writing system we call the alphabet. The roots of the words that make up the title of this lesson can be found in foreign soil; each word has a history that has traveled on the backs of people in books or in stories of labor and love. The lives of the immigrants that have carried their message are often misunderstood. This lesson will examine the life of The New Americans and consider the contributions of the world�s citizens to the fabric of the 21st century American experience. One of the greatest hurdles in the race to learn how to read is the skill of short vowel sound recognition. The �fancy, schmancy� name for this skill is phonetics but to the every day learner, the task may be daunting. Just as our sense of smell and taste are linked, our ability to read and be fully literate is linked to our ability to hear the sounds letters make both individually and when blended. This lesson uses resources from the PBS show, Between the Lions to help identify the sound �e� in words that are written, read and sung. A blank piece of paper is both revered and feared by writers. It is revered as the base for all writing, as important to a writer as canvas is to an artist. But it is also a feared instrument of torture for a student facing a standardized test. This lesson will present strategies to overcome the hurdles that discourage writers under pressure. In today's information age consumers manage data in ways that were once reserved for degreed professionals. The Microsoft Office Suite has become the global industry standard for word processing software and each version is more useful and user friendly. This lesson will provide users with strategies for using Microsoft EXCEL to process information for presentations. Techniques for calculating averages, counting values and presenting data will be described along with a few tips for working with Microsoft Word and Powerpoint. Few would deny the importance of women in securing the rights of Africans in 19th- and 20th-century America. These women often discovered how few rights they were afforded as they fought for the rights of others. This lesson will utilize video from the American Experience miniseries "The Lincolns: A House Divided" to investigate the co-evolution of two revolutions. Problems that involve calculations using very large or very small numbers can escalate into "crises" when the appropriate tools and techniques for solving them are not available. Scientific notation provides an effective means for handling numbers that might otherwise be considered "unwieldy" in problem solving. This lesson will utilize VOD technology to access instructional media that addresses scientific notation in less than 3 minutes! Growth patterns are amazing to observe. Many people can remember ruler-like charts hung by doting parents. Others might recall lessons in science using tree bark or fish scales as natural resources useful for studying growth trends. But what happens if upon every cycle of growth, the amount of matter doubles? This lesson will explore this phenomenon as a method of predicting trends. As a primary speaker of languages other than English, the desire to learn to communicate using different "rules" is a goal worth pursuing. This lesson will engage the English as a Second language learner in the task of learning to cope with challenges that arise during the pursuit of dreams. Listening skills, as a critical tool of communication, will be developed using an episode from the Connect with English series. At the heart of every human experience is the crisis of identity. As a nation, India has contemplated this crisis throughout time but now she finds herself confronting the issue on a global scale. This lesson will use the WIDE ANGLE Web site to explore the history and context of the issues facing modern India. Tenets and practices that bridge the gaps established in religion will be explored. Greek drama has deep roots in American theater. Many American venues stage productions featuring the universal themes presented in this ancient literary genre as a paradigm of life in modern times. Gospel music has deep roots in the American experience as well. The two--Greek theater and gospel music--have been engrafted together in GREAT PERFORMANCES� "Gospel at Colonus". This lesson will explore the artistic value in this new interpretation of the Greek chorus. This lesson examines the role of African-Americans in times of war. The struggle for equality in the military and the artistic expressions of African-Americans are scrutinized as the fruit grown in the toil of war. Through the activities presented in this lesson, students will begin to analyze the consequences and trade-offs associated with war from an environmental perspective. The student will investigate the mechanism for nuclear war and the geographic characteristics of the world that have predisposed some lesser-developed countries to the conquest of more-developed countries. The lesson plans below were designed by Bruce Carmel, who works at Turning Point/Discipleship Outreach Ministries Inc. as Program Director of the Educational Center. Bruce has been an educator for over twenty years in many different settings, including high school, community college, universities, and adult literacy classes. He has an MA and a PhD degree from the School of Education at NYU. Using the Internet for research can be overwhelming. Find out more about http://www.firstfind.info/, a valuable resource for the Adult Literacy/ESOL population. Holidays all over the world provide a meaningful theme for student reading, writing, and researching. Students can share their own experiences and knowledge, and in turn, learn from others. This unit uses nutrition as a theme. Basic reading, writing and math activities are created based on the theme. This unit asks students to reflect on heroes and role models. Students will write about people they know as well as celebrities they admire. Using photographs can add variety and energy to a reading, writing, or ESOL class. This unit is another way to solve the "I don't know what to write about" problem. These writing techniques may be especially helpful with students who prefer a style of learning or teaching that could be described as visual, spatial, or graphic. Use this technique to help students generate ideas and write with greater ease. Show students how to connect math concepts to their everyday activities. Teach your students about the concept of time lines. Help students develop research skills as they use the Internet to explore history. Expose your students to some aspects of technology as you give them an introduction to e-mail. Teach your students how to use real life materials to enhance their life skills. Add variety and excitement to your class by using TV and Video in the Classroom. Get your students engaged as you help them with job interviews, an important life skill. Amazing things can happen when adult education classes and poetry meet. Good teachers spend a lot of time trying to make lessons meaningful, important, and relevant to their students� lives. This lesson about students� values is an example of how to do this. The original lesson plans below were designed by Gayle Cooper, Staff Developer, Adult and Continuing Education, City University of New York. Each explores a content area in depth and moves students toward a rich knowledge of the subject, while at the same time developing core analytical skills. 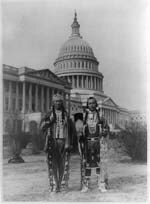 Native American chiefs in front of U.S. Capitol, 1927. Photo courtesy of the Library of Congress. This collection of activities helps students to compare and contrast the early migration and immigration experiences of three different cultural groups: Native Americans, African Americans, and the British colonists. Students identify and evaluate the institutions, values, and mores of different ancient civilizations. The activities engage students in comprehensive study through reading, writing, research, and oral presentation. Engaging a variety of perspectives and points of view, this and the following social studies/reading lesson introduce students to the "discovery" and early settlement of North America by Europeans. Using traditional fairy tales, this lesson allows students to reevaluate the familiar. Students read and analyze fairy tales incorporating literary and social theory in their discussion. Students are introduced to the function of the immune system and to the biochemical processes involved in fighting off disease. They are familiarized with how different kinds of vaccines work, and compare and contrast the characteristics of a variety of diseases. Students develop an understanding of the genre of memoir and learn about story structure, character development, and more! Uses point-of-view writing, geographical/map study, and non-traditional history texts to further deepen students' knowledge and analytic skills surrounding the European "discovery" of North America. Image courtesy of the School of Medicine at U. Missouri-Kansas City. Mary Ann Kuchta, artist. Students are introduced to the structure and function of cells and to the different types and purposes of cell division: growth, repair, and reproduction. They are familiarized with basic principles governing inheritance, and learn about the basic structure of DNA.